Its anthem is the wind in her trees and the waves of her seas. News Bulletin: The Flag of Earth, which had been unavailable since 2004, has been reintroduced as of October, 2007! See this Press Release for details. The Flag of Earth flies at SETI League headquarters, and at most other SETI locations around the world. It symbolizes the fact that SETI is carried out on behalf of humankind as a whole. The individual people, organizations, and nations involved are immaterial, since any signal received will belong to all of humanity, and represent Earth's entry into the Galactic community. 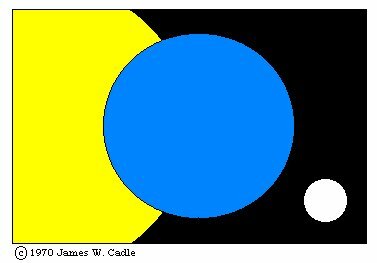 The yellow part of the flag is the sun, the blue circle symbolizes the Earth, and the small white circle represents the Moon. "It is with regret that I tell you that James Cadle died of a heart attack in his home over the weekend of June 19th . They tell us it was probably very quick and painless. He was cremated and we held a private family ceremony for him on his property in rural Illinois." At this time, it is uncertain whether the Flag will continue to be available through Flag of Earth Company International, the organization James founded in 1970. However, as noted in this editorial, the design itself has been placed in the public domain, and other organizations and individuals are encouraged to make and display their own Flags of Earth. When The SETI League launched its all sky survey in 1996, the Flag of Earth flew from the very first Project Argus radio telescope. 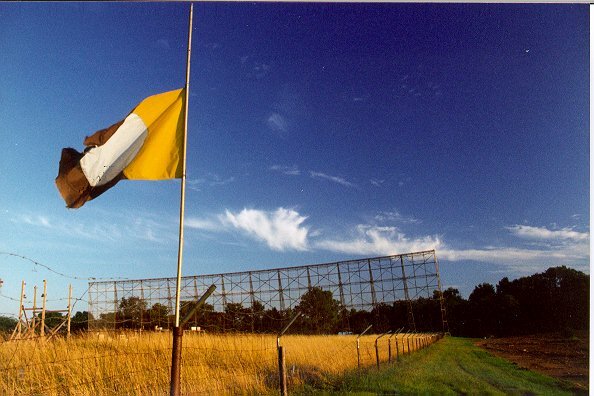 Click to enlarge This August 1997 photo shows a tattered Flag of Earth flying at half-staff above the Ohio State University Big Ear Radio Telescope in memory of SETI pioneers Barney Oliver and Carl Sagan, and also in honor of the facility's demise. Big Ear, home to the world's longest running SETI program, was demolished at the end of 1997 to make way for a commercial golf course. 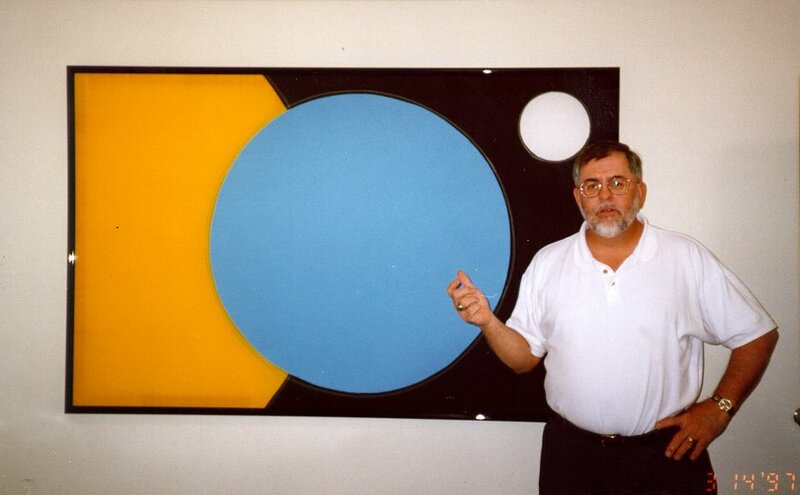 SETI League member Tom Pierson, who serves as Chief Executive of the SETI Institute, displays the Flag of Earth in his Mountain View, California office. 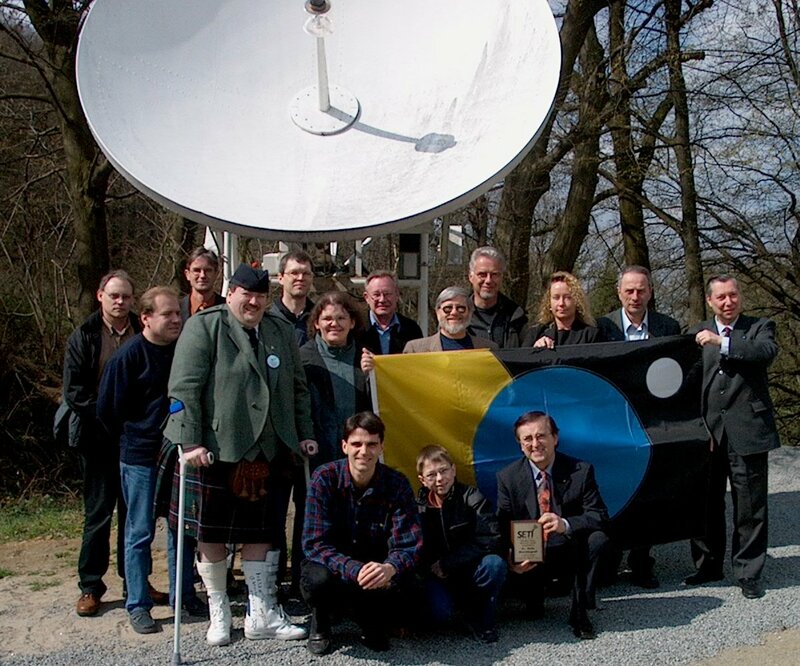 The Flag of Earth is prominently displayed at all SETI League meetings around the world. It is seen in this group photo taken at EuroSETI04, The SETI League's first European Science and Technology Workshop. 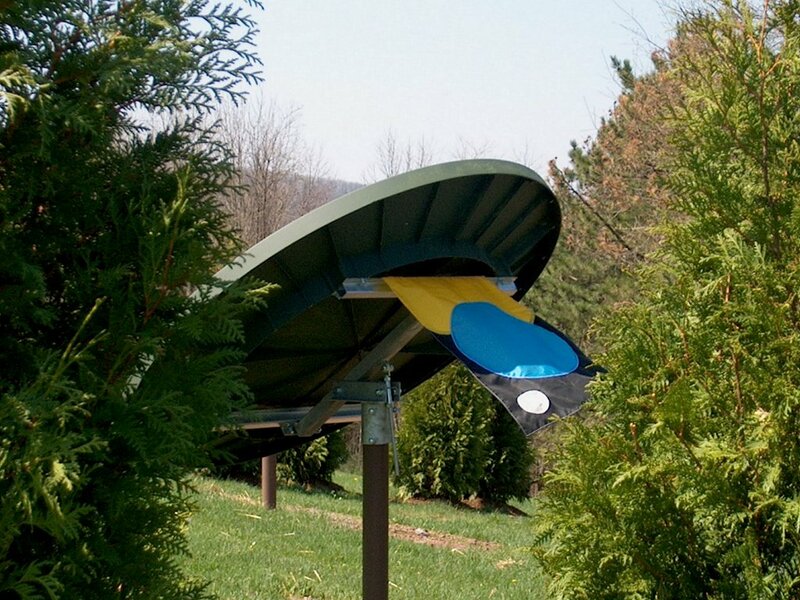 The Flag of Earth flying from one of the eight dishes of The SETI League's Very Small Array (VSA) in Pennsylvania. On 1 November 2003, Flag of Earth creator James Cadle abandoned his 23-year-old copyright on the Flag, transferring it into the public domain. See this editorial for details. 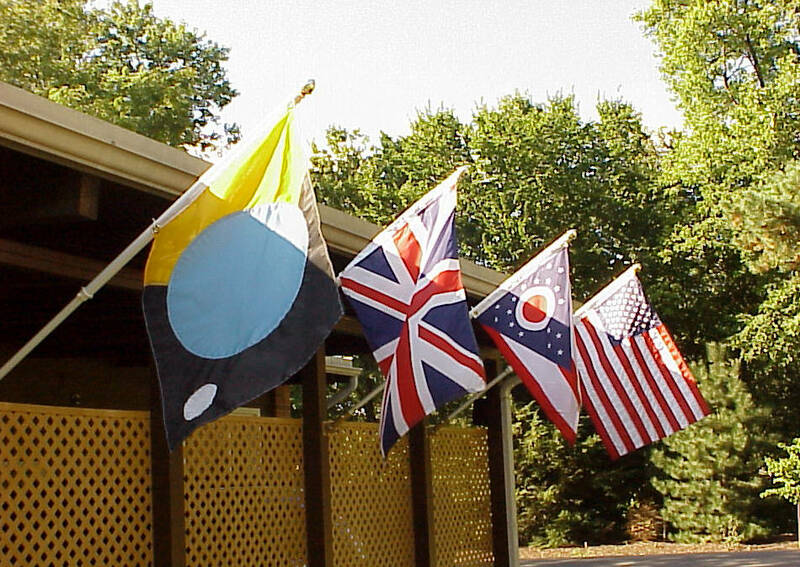 Four different flags fly at the Columbus Optical SETI Observatory in Ohio, USA. To the right of the Flag of Earth can be seen the Union Jack, the Ohio state flag, and the US Stars and Stripes. COSETI's Dr. Stuart Kingsley is a naturalized American who was born in Britain, but like most in the SETI community, he considers himself primarily a citizen of Earth.